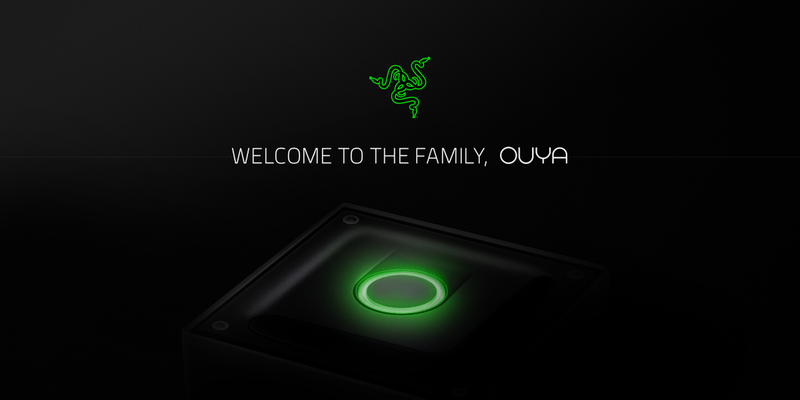 After a long period of stagnation, Ouya was acquired by gaming company Razer last month. At least that's what the business management firm Mesa Global said on its website. Now that transaction is official according to the Razer Twitter account and the snazzy graphic above. Details of the acquisition aren't available, but we do know that Ouya CEO Julie Uhrman isn't joining Razer. The Ouya never really gained traction, and it's unclear what sort of plans Razer has for the company. It's possible the underlying technology will just be absorbed into Razer. The storefront could find a place on devices like the Forge TV, but it doesn't seem likely there will be more Ouya hardware. I'd even be surprised if the brand name sticks around. Former Ouya CEO Julie Uhrman also confirmed the purchase and that she's leaving the company. "OUYA was a once in a lifetime experience. Now, I'm off to find the next...stay tuned!" she tweeted. That certainly makes is look like the business operations of Ouya won't be continuing, but the Ouya team will be joining Razer in some capacity. So that's the end of Ouya's crowdfunding fairytale. Razer's PR on the acquisition makes it clear this deal is all about the software. The Ouya hardware is done, but the store will be revamped and re-launched as Cortex for Android TV. It'll be a sort of Razer-specific content ecosystem. Razer plans to offer discounts to Ouya owners to help them buy a Forge TV, if they decide that's a thing they want.